“Erasmus Schroeter’s background in the tightly controlled society of the former German Democratice Republic provides the context for two different collections of work in one exhibition. The core theme within these two bodies of work is the juxtaposition between the individual and the collective worldviews developed in the socialist GDR during the forty years of its existence between 1949 and 1989. As an “alternative” artist in the GDR, Schroeter experienced everything that the Stasi, the notorious secret police, could throw at him. This gave him both an enduring mistrust of monolithic political ideologies and the freedom to take on taboo subjects such as Nazism and German militarism. The east German society in which Erasmus Schroeter’s career developed possessed a questioning creative spirit, borne of a personally experienced repression unlike anything in the west. Obsolete almost as soon as they were contructed, the huge bunkers of the Atlantikwall were built to protect the coasts of the Nazi dominated Festung (fortress) Europa. As they have crumbled and decayed they have become monuments, not to ‘heroic’ struggle but to the folly of military conceit. 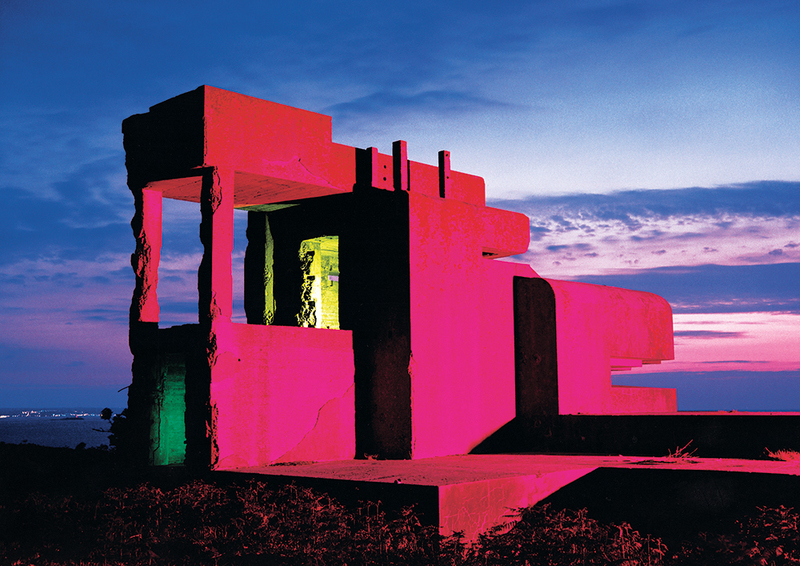 Bathed in theatrical light, the luminous colours, imposing scale and crumbling ruins of Schroeter’s Bunkers create a panorama which is both utterly arresting and wholly repulsive. Violence and beauty shift in and out of focus as the German Romantic landscape of longing, immortalised by Caspar David Friedrich, is co-opted by Schroeter for purposes which are anything but. Bild der Heimat is a series of elongated rectangular frames each of which contain a set of postcards mounted inside brightly coloured perspex. The supposedly collective, progressive and heroic image that East German socialism wanted to present to the world and to its people are featured in images of everything from shopping centres to industrial complexes and GDR holiday resorts. The self-aggrandising drabness of the postcards clashes violently with their consummately western presentation, implying a key to unlocking the enigma of the Bunker works themselves. The architectural rationale which underpin both Bunker and Bild der Heimat are pervasive ideologies. Yet, although the architectural vestiges of Nazism and Stalinism maintain a clear presence in the cities, countryside and coastlines of contemporary Germany and beyond, they are often invisible to the untrained eye. Schroeter work makes it impossible for these ideologies to conceal themselves and therefore to remain Hiding in Plain Sight”.